ISTEC FlowGuard™ Balancing Valves are ideal for Heating, Ventilation, Air-conditioning, as well as Solar and Heat Pump Systems. ISTEC’s FlowGuard™ Balancing Valves are ideal for heating, ventilation, air-conditioning, as well as solar and heat pump systems. Problems caused by excess or insufficient flow in hydronic systems can be rectified in no time at all with the 2900 Series FlowGuard™ Balancing Valves. They are also easy to operate and require no special training. ISTEC’s Flow Guard balancing valves can therefore be used to regulate HVAC systems quickly, with maximum precision and without the need for expensive measuring computers or special tools. All ISTEC balancing valves are equipped with an integrated flow meter, which continuously measures the flow and indicates it on a scale protruding from the side of the housing. The scale is graduated in g/min. and can be rotated about its own axis thereby allowing optimum positioning for convenient and accurate reading. The display is located away from the flow measurement chamber to protect it against dirt and debris. The inclined seat valve with regulating cone (also integrated) regulates the flow. The valve’s design characteristic ensures that the valve stroke is spread across several rotations of the spindle, which guarantees maximum setting accuracy and the design, ensures minimum noise. ISTEC’s balancing valves are not affected by the flow profile at the inlet, and a straight inlet route of the same length as the housing is therefore generally adequate. The valves can be mounted in any desired orientation, and an arrow on the housing indicates the correct direction of flow. 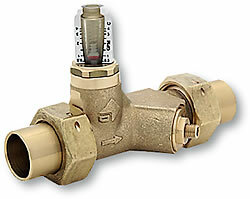 ISTEC’s FlowGuard™ valves for are ideal for quick and accurate balancing of hydronic circuits in HVAC systems. The Integrated flow scale with rotating indicator marked in g/Min displays the actual flow rate can be read off directly without the need for measuring computers or charts. The sight glass of the flow indicator is not installed directly in the medium flow and is therefore protected against fouling. The measuring accuracy is ±10% of the measured value. 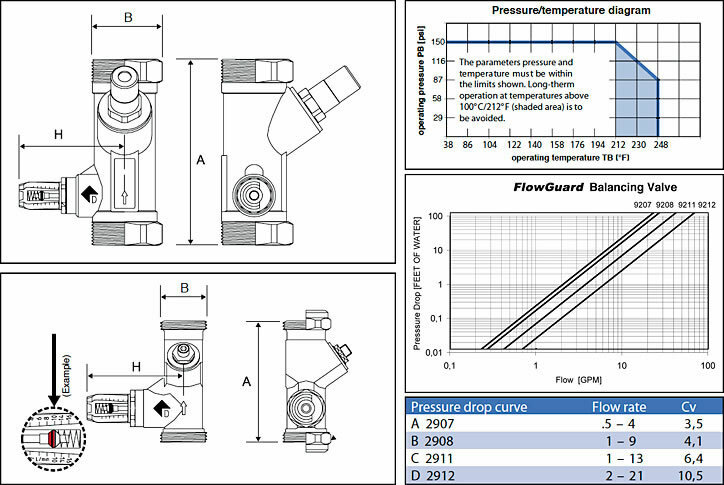 The flow rate is adjusted via several spindle rotations of the angle seat valve. Installation in the supply or return lines is acceptable. The body housing is made of Brass, Sight glass is made of impact and temperature resistant plastic, and the internal spring made of stainless steel. Gaskets are EPDM. The maximum operating temperature is 212°F and the maximum system pressure is 150 psi.